CRAZY DISCOUNT! Was: $259.95 Now: $159.96! Where do your pets sleep? Do your pets just climb on your bed without your consent? Getting them their own house should fix this problem. The Fir wood Chicken Coop is designed to house your small pets. Made of waterproof and anti-termite material, it will last for years to come. 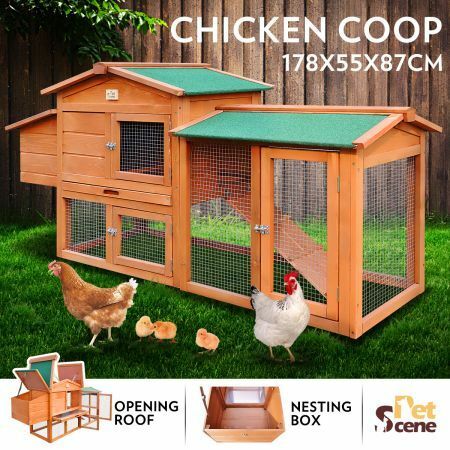 Featuring 3 open doors and a ramp, the chicken coop will give your pets easy access. The chicken coop is built with easy an open roof and sliding trays for easy cleaning. No more pets in your bed or unwanted places, the chicken coop will give your small pets their own home. Overall is small. Okay quality.